Agu Ramen's "Innovative Hot Mess," a garlicky ramen topped with fine shreds of Parmesan cheese. 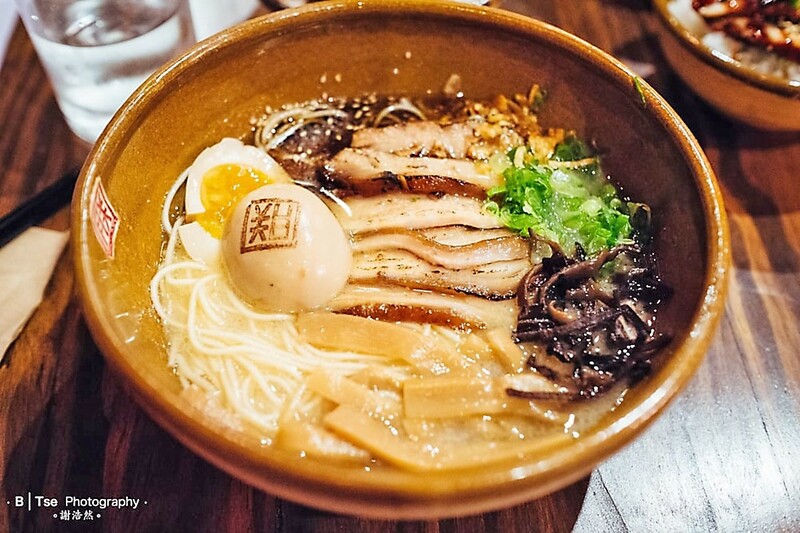 With the recent influx of chains from Hawaii and Austin, as well as a bunch of places simply trying to capitalize on a particularly long-lived trend, it seems like there’s a ramen joint on every other corner in Houston now (or at least in most neighborhoods). However, ramen is much more tricky to execute correctly than many people realize. When it comes to getting the texture right, ramen noodles can be incredibly finicky. A considerable amount of kitchen space has to be dedicated to allow vats of bones to be rendered for hours into well-made stocks. Then there’s the sheer manpower and skill needed to execute all ramen components properly. For example, Jim Wang of JINYA Ramen Bar told us that he has 15 staff members in the kitchen of his busy midtown location to ensure every bowl arrives at diners’ tables piping hot. This list includes contributions from Houston Food Finder editor Phaedra Cook, writer Josh Armendariz (who admits he’s a Tiger Den devotee—not that there’s anything wrong with that), and Carl Rosa, who founded the Ramen In Common group as well as Sushi Club of Houston. Rosa also conducts tours in Japan (and yes, some of the stops along the way are for eating ramen). Read on for where to spend hard-earned dollars on excellent, hearty fare. 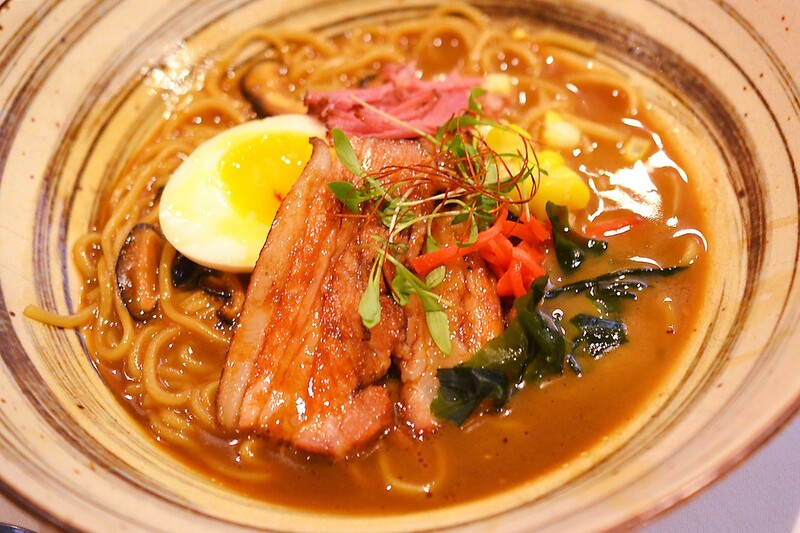 Agu Ramen, various locations: Agu Ramen is rapidly expanding across Houston and its suburbs with a full-fledged menu of traditional and non-traditional soups. Of the latter, the Hot Mess ($15) is as tasty as it is unusual. Tonkotsu ramen is infused with black garlic oil, garlic butter and garlic chips, then topped with an unlikely ingredient: a cloud of finely grated Parmesan cheese. It sounds bizarre, but the extra punch of umami from the hard Italian cheese works remarkably well for an over-the-top ramen experience. Check out the recent article from our visit for more details. 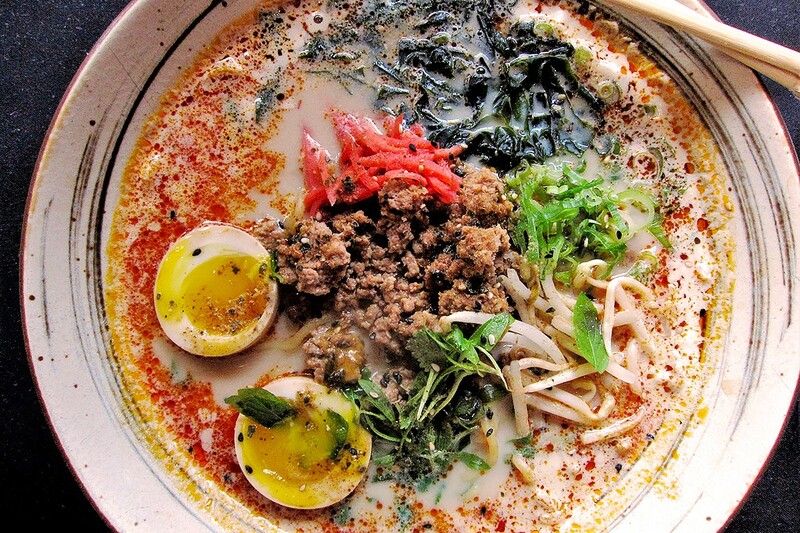 There are now seven Agu Ramen locations in the greater Houston area. Readers tell us that service can be slow, but hopefully that’s improving. 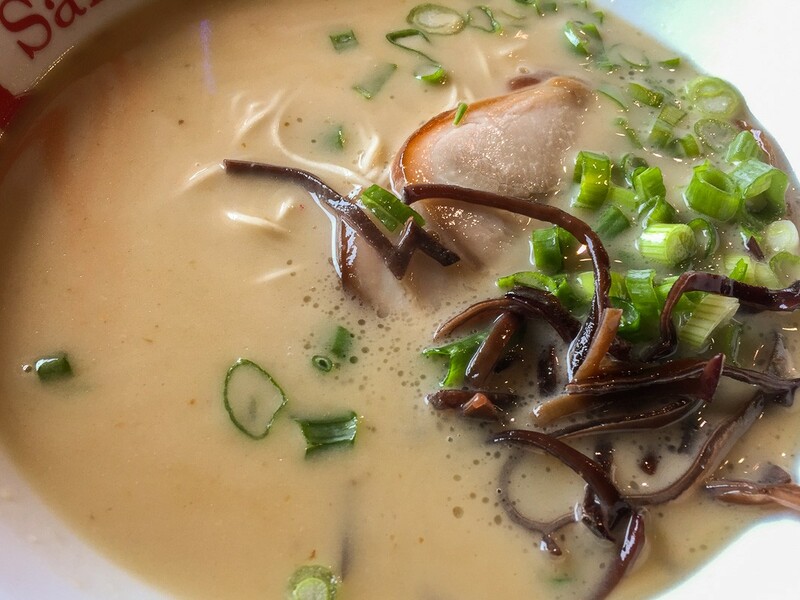 JINYA Ramen Bar, 3201 Louisiana: The first location in the area actually opened in Webster, but it’s JINYA’s more centrally located midtown Houston location that has become a favored late night hangout. 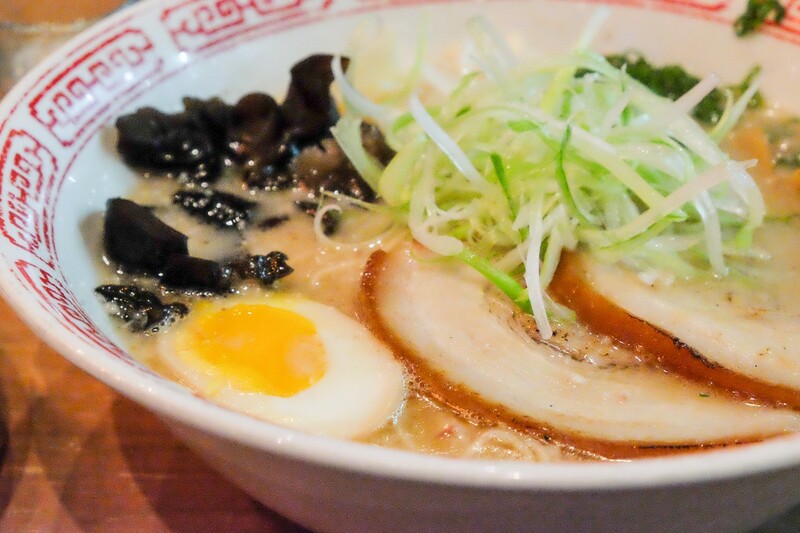 JINYA’s tonkotsu is very fine indeed: a milky, porky rendition full of lip-smacking richness. There are variants, and our favorites are the “black” ($12.95) and the “white” ($11.95). The white has a pork and chicken broth base. The black is pork stock only with the additions of garlic chips and garlic oil. The very hungry might order a starter of dumplings, well-fried until one side turns very crispy. Look for new locations soon! A JINYA will open in Katy in late June; another will debut in the 1960/Champions area in September. A Sugar Land location has been shelved in favor of one in The Woodlands that will open in 2018. Kata Robata, 3600 Kirby: Chef Manabu “Hori” Horiuchi’s restaurant was serving top-notch ramen since long before the big trendy wave of specialty houses came to Houston. There’s often a special, such as oxtail ramen, but diners can count on (and should try) the unique and lightly creamy Spicy Soy Ramen ($15), which includes braised ground pork, chili oil, soy milk, soft boiled egg, wakame and green onions. Kata Robata is a stellar, full-fledged Japanese restaurant. 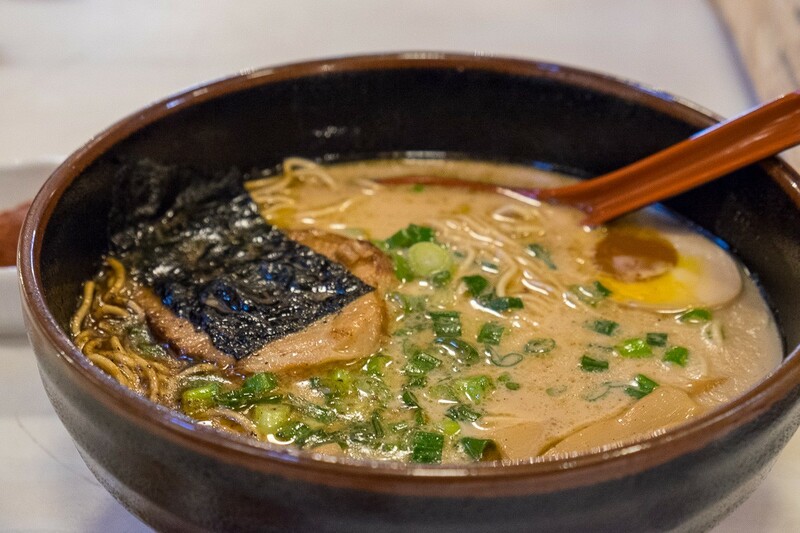 So if your companions don’t want ramen, they can indulge in a selection of some of the best sushi, sashimi and hot dishes in Houston, including award-winning chawanmushi and lobster macaroni and cheese. Ninja Ramen, 4219 Washington: This quirky spot (which features a giant teddy bear, among other things) is a favorite bar and restaurant industry hangout that goes off the beaten path with its ramen. It serves Asahikawa-style broth, which is named for the regional style of Asahikawa City in the Hokkaido Prefecture. It’s a blend of pork, chicken and light seafood stock that is complex and very flavorful. The “base model” is $12 and extra seasoned egg, pork belly and bamboo shoots can be added at for an additional fee. Ninja Ramen is also known for having one of the better inventories of Japanese whiskeys in the city. Service is always excellent and the staff is always happy to discuss the small but smart menu or make a drink recommendation. Ramen Jin’s tonkotsu ramen. Photo by Barry Tse. 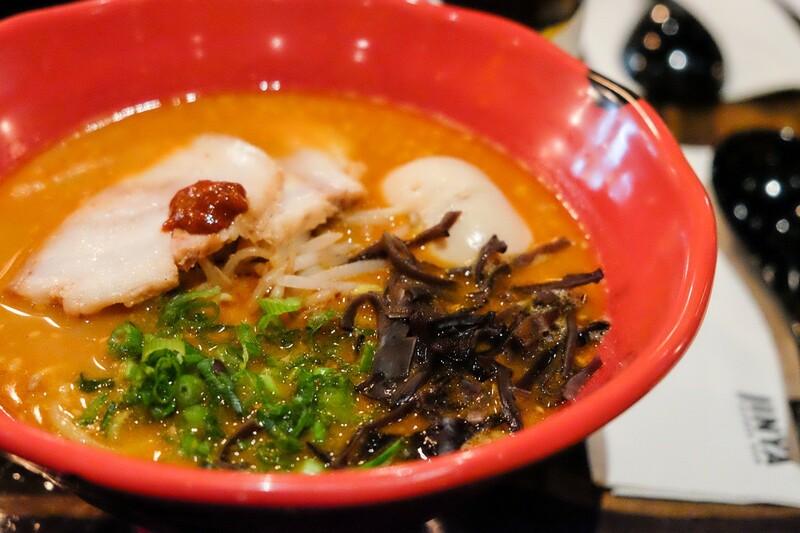 Ramen Tatsu-ya, 1722 California: Good things come to those who wait—eventually. Rumors of Austin-based Tatsu-ya coming to Houston were rampant as early as spring 2016. More than a year later, a location finally opened in the funky old house on California Street. It’s easy to miss when cruising down Westheimer as it’s offset from that main thoroughfare. Look for the giant money cat statue behind Da Marco. Decorative rope hangings and iconic Japanese drawings adorn the interior. 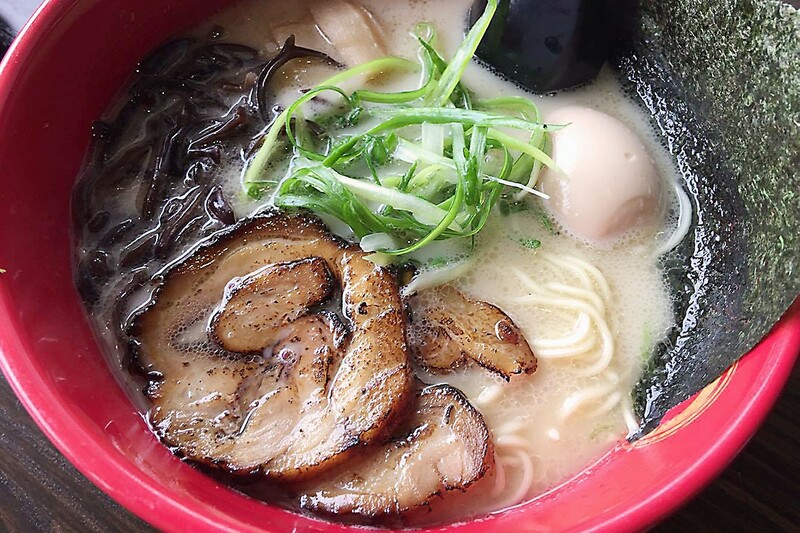 Try the tonkotsu shoyu, which includes chashu (pork roll), ajitama (seasoned soft-boiled egg), menma (simmered bamboo shoots), scallion, and nori, all punched up with a special soy sauce blend. Samurai Noodle, 1801 Durham: It would be easy to zip right past this underrated ramen stop in a nondescript strip center just off the feeder road, but don’t. Samurai Noodle actually makes noodles in-house (rest assured that’s no small feat), is fairly priced and allows diners to choose from among several different kinds of broth and five different levels of noodle firmness. 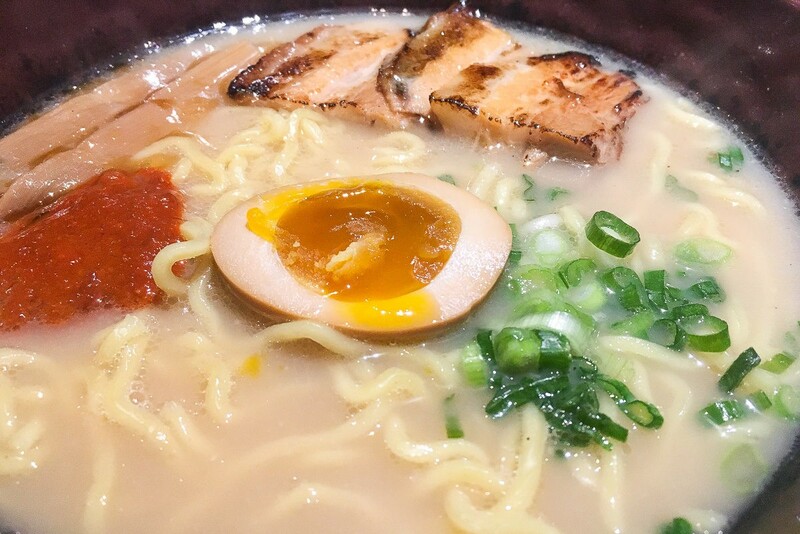 There are three “families” of ramen here: shouyu, or Tokyo-style, chicken-based clear broth; tonkotsu, or Hakata-style pork broth and tsukemen, or ramen noodles served alongside cold, thick, flavorful broth for dipping. (Tsukemen is fantastic on a hot summer day.) Under each family are several variants. For example, there’s traditional tonkotsu ($8.95), but there’s also bacon tonkotsu ($9.75) and spicy miso tonkotsu ($10.25). The best way to get familiar with all the offerings is to just drop in and start trying each to find a favorite. Soma Sushi, 4820 Washington: Both Soma Sushi and Kata Robata are operated by the Azuma Group. Soma Sushi’s cuisine, though, skews more casual than Kata Robata’s. Ramen is a big feature of the menu, with three kinds offered at lunchtime. A bowl of house ramen ($12) has pork stock with soy, which is then filled up with braised pork, a seasoned egg, slices of shiitake mushroom, a fish cake, sesame seeds, green onions, spinach and seaweed. There’s also a rare seafood ramen, the “Kaisen” made with a stock derived from king crab, as well as a more typical spicy miso.